This is one of the top questions we’ve been getting lately, and it’s an important one. How you decide to file taxes as a household affects how much you pay in taxes and your student loan payments. The vast majority of households in the U.S. file a joint tax return. But more and more are starting to file their taxes separately as they factor the potential student loan savings into the equation. How does filing taxes separately save money on student loan payments? When someone is on an income-driven repayment (IDR) plan, the payments are calculated based on discretionary income. The higher the income, the higher the student loan payments. The lower the income, the lower the payments. The income used to calculate the student loan payment is generally taken from the borrower’s latest tax return. If the borrower is married to someone who makes an income and they file their taxes jointly, the loan servicer will use their household income to calculate the payment. But there are two decent repayment plans in particular that allow the borrower to file their taxes separately: Pay As You Earn (PAYE) and Income-Based Repayment (IBR). On these plans, the income-driven payment is based on only the borrower’s earnings and not their spouse’s. Well, the student loan payment is only one component. The amount of taxes paid for the household as a whole are affected by the way a couple files taxes, too. What are the differences in taxes between filing separately and jointly? The bottom line is couples typically end up owing more in taxes as a household when they file separately. This is primarily due to how each spouse’s income hits the tax brackets as individuals. Plus, there are some tax deductions and credits that go away or are harder to get, especially for couples with kids. Let’s take a look at the difference in estimated taxes paid in two different scenarios. Let’s say a dentist is married to a social worker. The dentist earns $300,000, and the social worker earns $50,000. According to the 2018 federal tax brackets, they’re estimated to pay around $67,700 in federal taxes as a household. If they filed separately, the dentist spouse would owe about $76,529 on their tax return. The social worker spouse would owe about $4,370. This totals $80,899 together. Filing separately could cost them over $13,000 in federal taxes as a household versus filing jointly. Let’s say a pharmacist and a nurse practitioner are married and making $110,000 each. 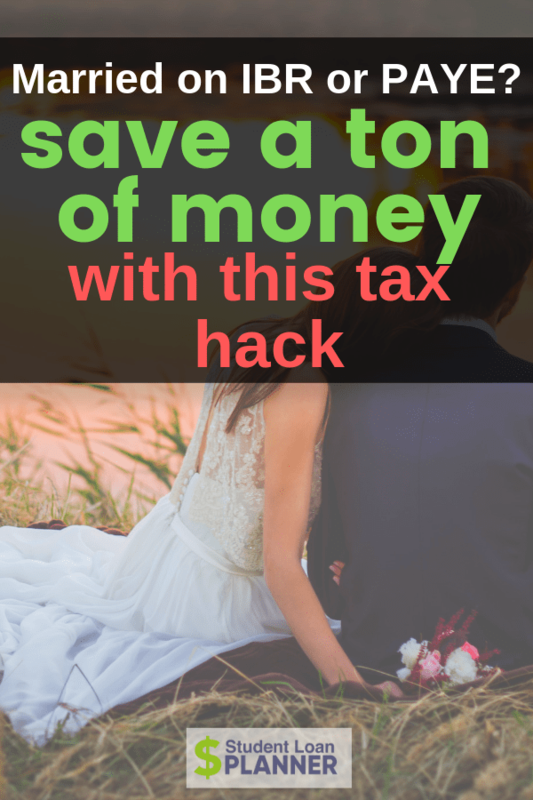 According to the 2018 federal tax brackets, they’re estimated to pay $35,620 as a household if they were to file their taxes jointly. They’d each owe $17,810 if they filed separately for a total of $35,620. Their federal tax liability would be the exact same as a household no matter which way they filed their taxes. The tax brackets are only part of the equation when determining whether a couple should file separately or jointly. Couples can lose out on some other deductions and credits as well. The most relevant credit is the child dependent care tax credit (CDCTC) — not to be confused with the child tax credit (CTC). (Why do these names have to be so similar?) Also the student loan interest deduction goes away. Those two items might add up to an extra $2,000–$3,000 in taxes a couple could pay if they file separately. Here’s a summary from Betterment of the other credits and deductions that are affected by filing separately. Filing taxes separately also drastically reduces the ability to deduct a Traditional IRA contribution as well as eligibility for Roth IRA contributions. So, the lower income-driven student loan payments may be offset by the higher taxes and subtraction of other benefits. Which filing status will save you the most money paying back student loans? Filing separately if both spouses have federal student loan debt eligible for IDR doesn’t make much sense. There are a few exceptions, but this is really only a decision for married couples where one of them has student loans. The equation we use here is a holistic one based on what’s best for the household, not one spouse. We need to look at the entire household taxes and student loan payments to see which method would be better. Generally speaking, we know student loan payments will be lower if couples file separately, but they’ll most likely pay more taxes as a household. If the result is a positive number, then married filing separately will give the most household savings net of taxes. If it’s negative, then married filing jointly will save the household the most money. Both IBR and PAYE allow the person with the student loans to file taxes separately. This way, loan payments are calculated based on their income alone. IBR and PAYE are also both capped at the 10-year standard payment. This means that when the monthly payments are being calculated based on income, the payment will never exceed the fixed payment that would pay off the loan in full in 10 years — kind of like a 10 year mortgage payment. Each plan also has a “tax bomb” at the end. This means that while the remaining loan balance is forgiven, the federal government will issue a 1099 tax form with the forgiven amount. The forgiven balance will be added as income on that year’s tax return, and the borrower could then owe a large amount of taxes on the forgiven balance. There’s also a major difference between the two plans: PAYE is a 20-year program with payments based on 10 percent of discretionary income whereas IBR is a 25-year program with payments based on 15 percent of discretionary income. Why would anyone choose to pay 15 percent for 25 years instead of 10 percent for 20 years? PAYE is almost always the way to go if someone is eligible for either plan. But if someone borrowed their first student loan before Oct. 1, 2007, they generally aren’t eligible for PAYE. If they still want to file taxes separately, IBR is their best option. A quick word about Revised Pay As You Earn (REPAYE): This is a 25-year program with payments based on 10 percent of income. The difference from IBR and PAYE is REPAYE’s student loan payment calculation will include the spouse’s income, regardless of how a couple files their taxes. As such, those on REPAYE shouldn’t file their taxes separately in an effort to lower their student loan payments. Even so, it could still be worth comparing if someone isn’t eligible for PAYE. Eligible for PAYE? Will filing taxes separately or jointly save you the most money? Let’s get down to brass tacks here. I’ll give you two examples where one spouse is the breadwinner and owes the student loan debt and another where the breadwinner isn’t the spouse with the student loan debt. Jamie and Adam got married this year. Jamie is a psychologist with $250,000 in student loan debt at 6.5% interest. She has her own practice making $125,000 and has been on PAYE for five years. Adam is a teacher making $40,000 with no student loan debt. Both anticipate their incomes growing at 3 percent. *Assumptions: Tax bomb savings growth rate is 5 percent per year. Tax rate at time of loan forgiveness is 40 percent. The numbers here would show there is an estimated $35,000 in savings on the student loans as a whole if Jamie and Adam filed their taxes separately for the next 15 years while Jamie finishes out PAYE. That’s about $2,333 per year on average in student loan payment savings. If we just look at the payments this year plus the tax bomb savings, filing separately will cost Jamie $1,427 per month ($893 student loan payment + $534 tax bomb savings) while filing jointly will cost $1,602 ($1,175 + $427). That’s only a $2,100 benefit to file their taxes separately. They ran their taxes both ways, and it’s projected to cost them $3,000 more in taxes to file separately. Using the equation: ($2,100 student loan payment savings MFS) – ($3,000 more in taxes MFS) = -$900. Jamie and Adam should file their taxes jointly to save the most money this year. They can make a fresh decision each year on their tax filing status, but the numbers look like filing jointly will save them the most money net of taxes. Now let’s switch it. Let’s say Amber is a chiropractor with $250,000 in student loan debt and is making $40,000 working part time. She’s been on PAYE for five years as well. Her husband George works in IT making $125,000. Notice PAYE filing jointly is the exact same as with Jamie and Adam, but the filing separately scenario is completely different since the breadwinner isn’t the one with the student loans. Now we’re looking at a difference of over $120,000 savings to pay back the student loans if they were to file separately. That works out to be about $8,000 per year over 15 years. Just like Jamie and Adam, Amber and George would pay $3,000 more in taxes by filing separately. Amber and George should file their taxes separately to save the most money net of taxes as a household. As income changes from year to year, so can the result of this equation. The good news is they can compare the taxes to student loan payments and decide how to file their taxes each year if they’re on PAYE. They can and should make a fresh tax filing status decision each year. In conclusion, there appears to be a greater benefit to filing separately if the spouse with student loans is making less money. The couple has the same tax penalty regardless of who has the loans, but the cost to pay back the loans goes way down. If someone isn’t eligible for PAYE because they took out loans prior to Oct. 1, 2007, then it’s a little more complicated. They would have two great loan repayment options: IBR and REPAYE. Both IBR and REPAYE are 25-year plans, but IBR payment is based on 15 percent of income and allows you to file separately to only take your income into consideration. REPAYE is based on 10 percent of income, but the tax filing status doesn’t matter. It will take the spouse’s income into consideration either way. It’s obvious that choosing IBR filing jointly and paying 15 percent of household income is not nearly as good as choosing REPAYE filing jointly and only paying 10 percent of household income. That’s why we aren’t going to compare IBR filing separately versus filing jointly in these examples. We’ll substitute REPAYE when filing jointly. The question is, would someone save more paying only 15 percent of their income or 10 percent of the household’s income? Let’s take a look using the same scenarios from PAYE filing separately versus jointly. First, let’s go back to Jamie who owes $250,000 at 6.5% and is earning $125,000. We’ll pretend she’s not eligible for PAYE now. She’s been on REPAYE for five years and just got married to Adam, who is earning $40,000. This is a no-brainer REPAYE situation. The payments are lower, and the overall cost of loan repayment is projecting to be lower. There’s no need to pay more taxes by filing separately since there’s no student loan payment savings. Now let’s take a look at the reverse with Amber and George. Remember that Amber works part-time making $40,000 and owes $250,000 in loans at 6.5% while George makes $125,000. Now she isn’t eligible for PAYE either. It’s amazing the reversal. This is a no-brainer IBR filing separately scenario. Filing separately will save them over $150,000 over the 20 years as she finishes out REPAYE. That’s about $7,500 per year. If they’d pay only $3,000 more in taxes, then they would save $4,500 this year by doing that (almost $400 per month net of taxes). Accrued interest will capitalize into principal if someone switches repayment programs. That means your loan could grow faster. With PAYE, there’s no harm in deciding your tax filing status each year. But with REPAYE and IBR, it’s important to project as best you can and stick with the plan unless something drastic happens. A married couple will not pay as much in taxes when filing separately if their income is fairly close. The wider the income gap, the more the household will generally owe in taxes if they file separately. If the person with student loans has higher income, then any and all deductions to Adjusted Gross Income (AGI) could change their side of the income equation. For example, let’s say Doug earns $100,000 and owes $200,000 in debt while Julie earns $70,000 and has no student loans. They are both contributing 6 percent of their income to get their maximum employer matching contribution to their retirement plan. They still have another $1,000 per month they could put into retirement. Doug is on PAYE, and they’re filing their taxes separately. Rather than splitting up the $1,000 50/50, Doug could put the $12,000 per year into his retirement only. That would reduce his AGI from $100,000 to $88,000. Julie’s would stay at $70,000. Now Doug can also put $7,000 into his HSA, which lowers his AGI down to $81,000. By reducing Doug’s AGI by $19,000, their individual incomes are only $11,000 apart rather than $30,000, so the extra taxes from filing separately should go down. Doug would also benefit from lower student loan payments the following year. Remember that PAYE is based on 10 percent of discretionary income, so lowering Doug’s income by $19,000 will reduce his student loan payment by $1,900 for the year. It’s a win-win…win! Less taxes, lower student loan payments, and awesome additional nest egg savings! Someone with student loans who lives in a community property state might also be able to save even more money paying back student loans if they file taxes separately. Nine states are community property states and have different laws around whose income is whose. These are Arizona, California, Idaho, Louisiana, New Mexico, Nevada, Texas, Washington, and Wisconsin. The gist of it is any salary, wages, or other pay received for services performed by either or both spouses while married basically belongs to both spouses equally. There are other nuances which I’ll spare you, but feel free to read this from the IRS website if you’re so inclined. The benefit to couples who live in a community property state is that this community income is equally distributed between the spouses if they were to file separately. In other words, if a doctor made $300,000 in income and her psychologist spouse made $100,000, they would each claim $200,000 on their income if they were to file separately rather than their individually earned income if it’s considered community income. This typically means a couple would pay less in taxes by filing separately than they otherwise might in a common law state. Where this is really attractive is if that doctor I mentioned had student loans and was going for Public Service Loan Forgiveness (PSLF) but their PsyD spouse didn’t have loans. This “breadwinner loophole” would lower the doctor’s income dramatically, thereby significantly lowering their cost to pay back the loans while going for PSLF. If you’re interested to learn more, check out Student Loan Planner Podcast Episode 6. Should you file taxes separately on IBR or PAYE if you both have student loans? This is a fairly common question because it’s hard to find the right answer on how this works. When both spouses have student loan debt and are on an IDR plan, then filing taxes separately gives very little reduction in student loans and usually ends up costing the couple more in taxes than it saves them in loan repayment. Let’s say both are on PAYE, and they file their taxes jointly. One spouse makes $150,000, and the other makes $50,000 — 75 percent of household income and 25 percent of household income. The loan servicer will calculate the household payment based on the household income of $200,000. Of that payment, 75 percent will go to the loans of the $150,000 earner, and 25 percent will go to the loans of the $50,000 earner. If this couple were to file taxes separately and certify their income using their individual tax returns, they might have slightly lower payments due to an extra deduction to their discretionary income. But it usually isn’t enough to cover the difference in taxes. There’s a little more nuance to this, but I’ll skip it for now. Bottom line is that if the difference is negligible, then I usually err on the side of filing jointly. I wanted to lay out multiple scenarios of how tax filing status could affect student loan repayment to give you some great ideas, but your situation is unique. There’s a ton of money at stake when we’re talking about paying back six-figure student loan debt. So it makes sense for an expert to review your specific situation while taking family size, career path, household income, and financial goals into consideration. Our team has done over 1,800 student loan consults and over $480,000,000 in student loan debt. We’d love to help you to finally feel confident about how you’re handling your student loans and to save as much money as possible. By the end of a consult with us, you’ll understand the path that will save you the most money paying back your loans. You’ll also gain the clarity you need to feel in control. Please feel free to reach out to me directly with any questions at rob@studentloanplanner.com. Or take a look at our consult page to learn more. Disclaimer: This content is for informational purposes only and is not meant to be tax advice. We highly recommend you work with a tax professional for all tax advice and especially when figuring out whether you should file your taxes jointly or separately. I’m confused about the tax bomb comments. Good question Lauren. There is no tax bomb for PSLF. For IDR forgiveness over 20 to 25 years in the private sector, you have to pay taxes on the forgiven amount.